We actively participate in the development of the communities in our service area. Through leadership roles and financial committments, we contribute to economic development and business expansion within our service territory. Our service area remains attractive to new businesses and the employees who work there, because of the many advantages we have to offer. Nebraska has an overall cost of living that ranks below the national average in all major categories, including food, housing, utilities, transportation, and health care. Our communities are full of hardworking people who take great pride in their jobs, families and in themselves. Perennial Public Power District headquarters is located in York, Nebraska. Our service area covers York and Fillmore counties. East-west Interstate 80 is located near the center of our District. North-south U.S. Highway 81 runs through our entire service area. This highway is part of the Pan American Highway, which begins at the southern tip of South America and extends north through Central America, Mexico, the United States, and terminates at Winnipeg, Canada. Because of the transportation access, new business interested in relocating or expanding in Nebraska couldn’t find a better location than in Perennial Power’s service area. York is served by the main line of the Burlington Northern Santa Fe with as many as 70 freight trains daily. Switching is done by local switch crews twice daily. The Fairmont State Airfield, originally constructed and used as a training base in World War II, provides adequate air service, including hanger rental space. The York Municipal Airport has a 5,900 foot lighted runway and a 4,300 foot turf runway. Other facilities include hanger rental and jet and 100 low-lead fuel. Charter service is available. Scheduled air service is available at the Central Nebraska Regional Airport near Grand Island, 41 miles west, and the Lincoln Municipal Airport, 45 miles east. Passenger, air freight, and air express services are available. Both corporations will assist in site selection, permitting, financing, tax packaging, and relocation. Exeter, Nebraska – 8,800 sq. ft. commercial building located at 115 West Seneca. 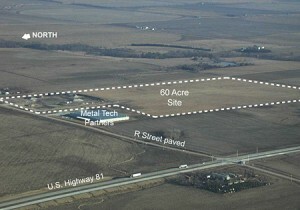 Geneva, Nebraska – Fillmore County Industrial Park – 60 acre site at 2105 R Street. Perennial Public Power District provides electric service to the Fillmore County Industrial Park located at the Fairmont State Airfield. Contact us for more information. A variety of information is available online for the York and Fillmore County area. To learn more about the labor statistics and other trends in this area, please visit one of the links below. Perennial administers an economic development loan fund to enhance the economic climate of the area by helping finance projects that lead to the creation of jobs and long-term employment for residents, and sustained growth in the area. The Nebraska Advantage package was designed to create a business climate that makes Nebraska the preferred location for starting and growing your business. The Nebraska Advantage rewards businesses that invest in the state and hire Nebraskans. In this progressive, pro-business tax climate, corporate income and sales taxes are reduced or virtually eliminated. Read more about the Nebraska Advantage package.